In C programming, variables or memory locations should be declared before it can be used. Similarly, a function also needs to be declared before use. Data types simply refers to the type and size of data associated with variables and functions. A data type specifies the type of data that a variable can store such as integer, floating, character etc. These are fundamental data types in C namely integer(int), floating(float), character(char) and void. Integers are whole numbers that can have both positive and negative values but no decimal values. Similarly, int of 2 bytes, it can take 216 distinct states from -215 to 215-1. If you try to store larger number than 231-1, i.e,+2147483647 and smaller number than -231, i.e, -2147483648, program will not run correctly. void type means no value. This is usually used to specify the type of functions. Data types that are derived from fundamental data types are called derived data types. Derived data types don't create a new data type but, instead they add some functionality to the basic data types. In C, derived data type are : Array, Pointer, Structures, Enumeration & Union. Qualifiers alters the meaning of base data types to yield a new data type. The size of double is 8 bytes. However, when long keyword is used, that variable becomes 10 bytes. The long is a size modifier, indicated by keyword long, that may increase the size of a variable during declaration. This program will demonstrate the working of long keyword. In this program, the sizeof operator is used to find the size of int, long, long long, double and long double. The long keyword cannot be used with float and char type variables. There is another keyword short which can be used if you previously know the value of a variable will always be a small number. There is another qualifier signed which can hold both negative and positive only. However, it is not necessary to define variable signed since a variable is signed by default. An integer variable of 4 bytes can hold data from -231 to 231-1. However, if the variable is defined as unsigned, it can hold data from 0 to 232-1. It is important to note that, sign qualifiers can be applied to int and char types only. An identifier can be declared as a constant. To do so const keyword is used. The value of cost cannot be changed in the program. A variable should be declared volatile whenever its value can be changed by some external sources outside the program. Keyword volatile is used for creating volatile variables. 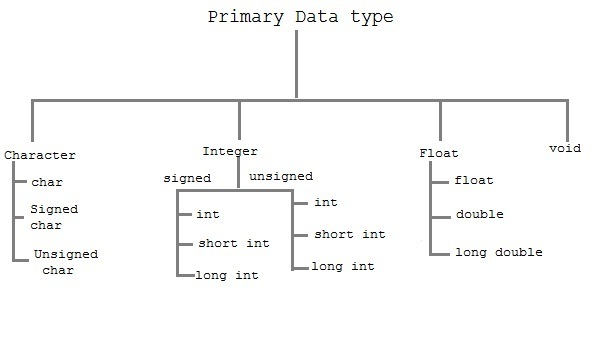 The primary data types are integer-based and floating-point based. C language supports both signed and unsigned literals. The memory size of primary data types may change according to 32 or 64 bit operating system. Let's see the primary data types. Its size is given according to 32 bit architecture. LearnFrenzy provides you lots of fully solved "C Programming Data Types" Questions and Answers with explanation.